He then dropped me off at a different hostel on Donegal Pass, just across the street from a Rangers pub. I paid the man and walked back home. Please note: This article is just the second installment of a seven-article series. An outline of the historical context of the conflict can be found in the previous installment. I set out on the rocky road to Belfast on December 23 at 5 p.m. from Berlin-Schönefeld. The flights I had booked were to Shannon, all the way on the Wild Atlantic coast of the Republic of Ireland—meaning that I would have to take a night bus to the airport in Dublin at midnight, and then hop on the express bus to Belfast at 5 a.m. The road to Belfast was smooth. I fell asleep straight away and woke up in Northern Ireland. There were no passport or security checks of any kind, even though we did cross and international border. The bus dropped me off in the city center, about a twenty-minute walk away from my hostel, which was close to the university in South Belfast. Just as I had expected, the city greeted me with a cold morning drizzle. I arrived at my hostel at around 7:30 a.m. just hoping to sleep for a few hours before going out to see some of the city and hopefully find a place where to spend Christmas Eve. Unfortunately, check-in was not until 2 p.m., and I had no choice but to fall asleep on a couch in one of the common areas for a bit before getting my first full Irish breakfast and then heading out. Belfast, or Béal Feirste in Irish, is the second largest city in Ireland and the capital of Northern Ireland. It also bore witness to horrible violence and terror for decades. The city has cleaned up its image, and is welcoming an ever growing number of visitors every year. The scars from the conflict won’t be instantly visible unless you wander to the areas outside of the center—that is, in the areas few tourists go to but in which I spent most of my time while in the city. In the city center you won’t see much that immediately reminds you of The Troubles unless you are in the know. You’ll walk by pubs and hotels, including the fancy Europa Hotel and think to yourself “damn, this is a fancy city.” However, the Europa Hotel is also the most bombed hotel in the world, racking up a total of 36 attacks. Stores, bars, shopping areas, international cuisine, upscale bars, gourmet coffee, diversity—downtown Belfast is just like any other modern city in Western Europe. 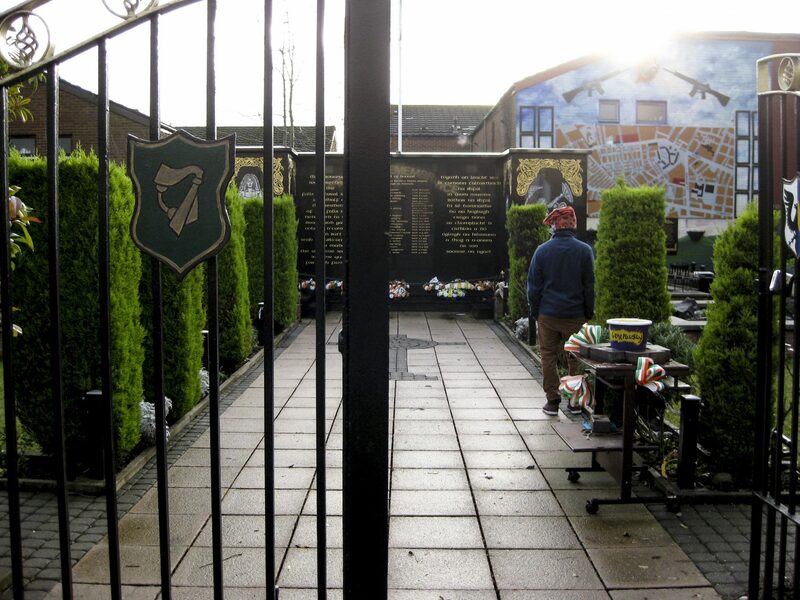 Likewise, it is a neutral zone away from the murals featuring armed men in balaclavas, the remembrance gardens adorned with Armalites, the flags of Protestant paramilitary groups hanging from light posts, or the IRA graffiti ubiquitous in other parts of town. 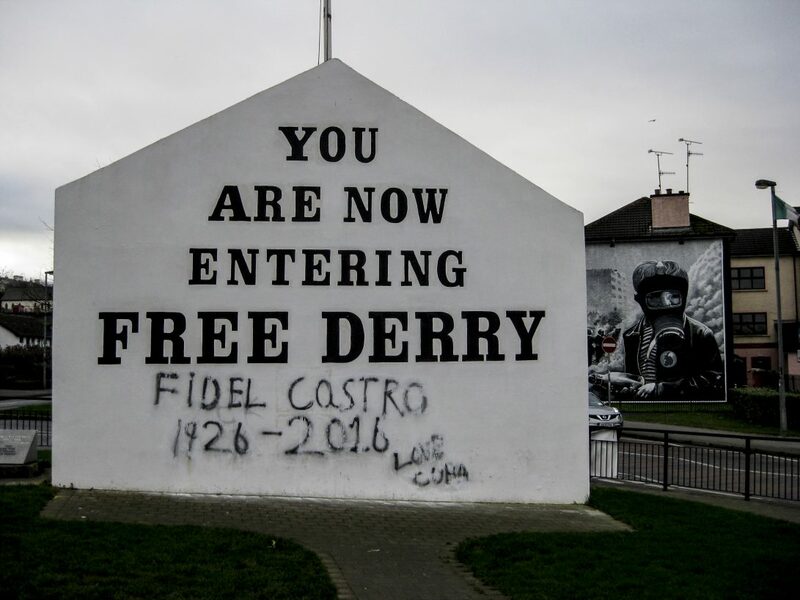 Therefore, the city center is a preferred spot for many who want to look beyond the violent legacy of The Troubles. Outside of the city center or the university quarter everything starts to change. 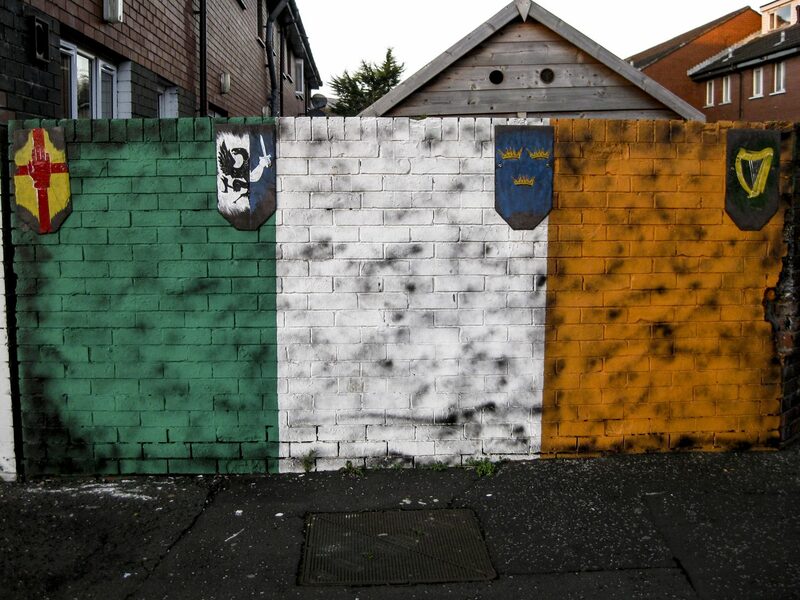 Belfast is a divided city, and both Republicans and Loyalists (or Catholics and Protestants) live in completely different worlds. Belfast is a city more divided than many others I’ve visited—even in the Balkans. Cities in the Balkans are not divided by walls, and houses of worship of other religions are still found in “the other side of town.” In Belfast, Catholic and Protestant zones are divided by walls—the so called “Peace Lines,” with a total length of 40 kilometers. These walls, three times as high as the Berlin Wall, are not meant to keep people from leaving (which is why it is wrong to compare it to the Berlin Wall) but just to separate the two communities. The Peace Walls can be crossed at various points, which nevertheless close at night. These parts of town are not completely walled off either; it is possible to enter using alternate routes, which are always open. I took a green taxi tour with a very knowledgeable and likeable local, who explained me that, while “for tourists it might be absurd to see neighbors separated by walls, to me it’s entirely normal because I grew up with them.” He also said that most would like to see the walls come down, but that the people living next to them will not let that happen. For me it was totally unbelievable. To think I couldn’t cross from Kreuzberg to Friedrichshain because of my private political opinion, heritage, or religion is unimaginable. 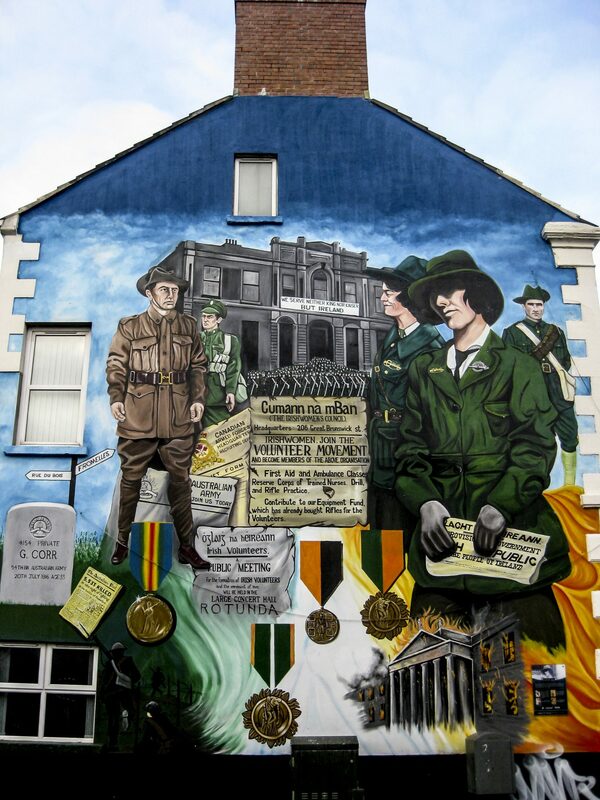 A Republican mural dedicated to Cumann ba mBan, the women’s wing of the IRA. 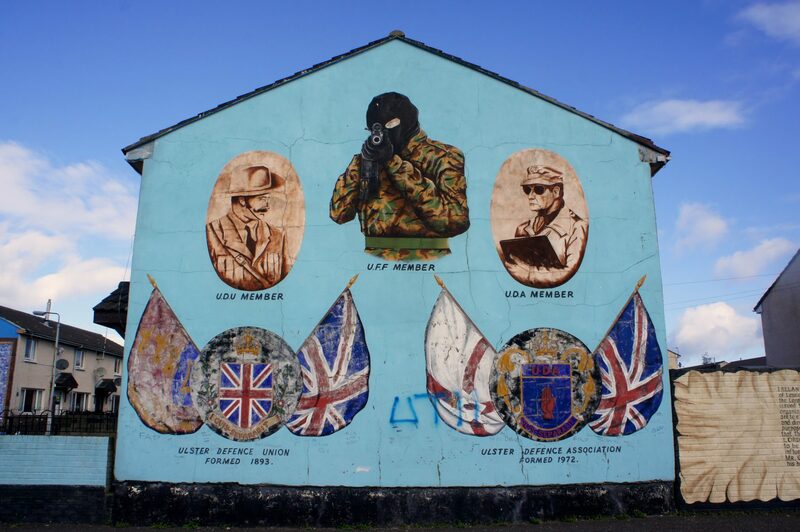 The reminders of the conflict are still visible, and while many of the more militant murals, such as the Shankill Mona Lisa, have already been painted over, new ones keep popping up all over town—some showing members of banned paramilitary organizations. These murals announce on what side of town you are. 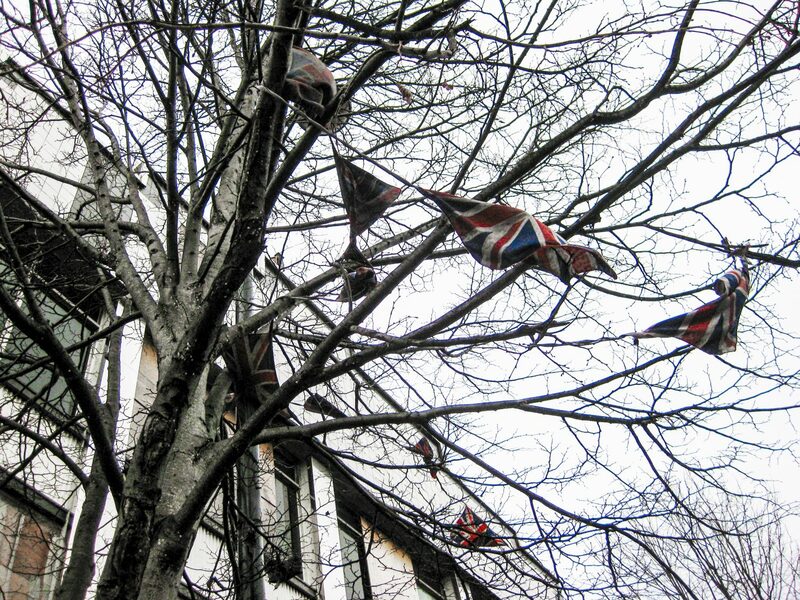 But there are many more signs: For example, only in a Protestant area will you see Union Jacks or Northern Irish flags. 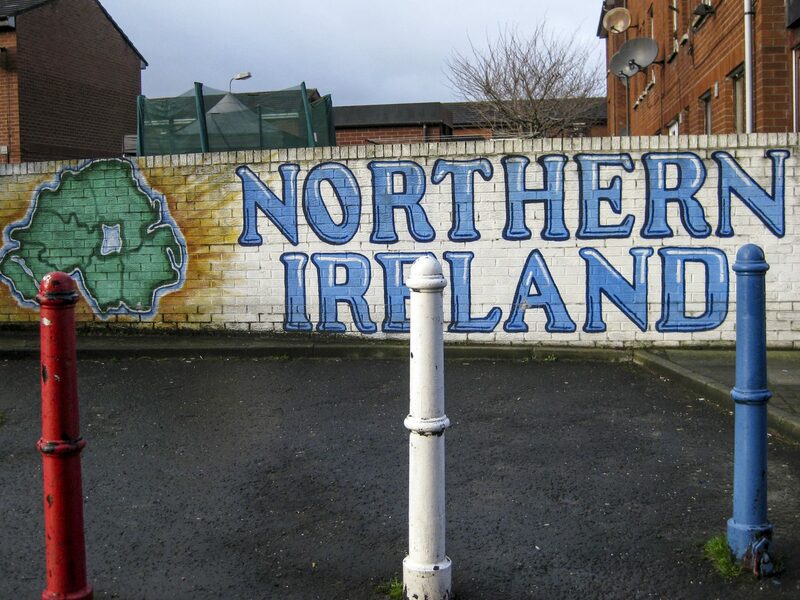 The Northern Ireland national team has a mostly Loyalist following, and I didn’t even see so much as a single mention of it in Republican areas—where the team of the Republic of Ireland is supported. 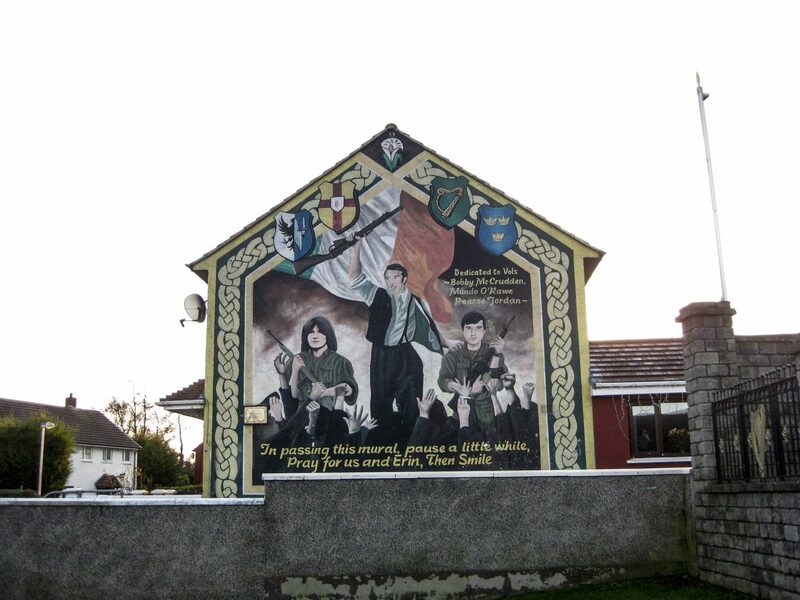 The Irish tricolor flies undisturbed in Republican areas, and murals commemorating historical events such as the Easter Rising from 1916 are ubiquitous. 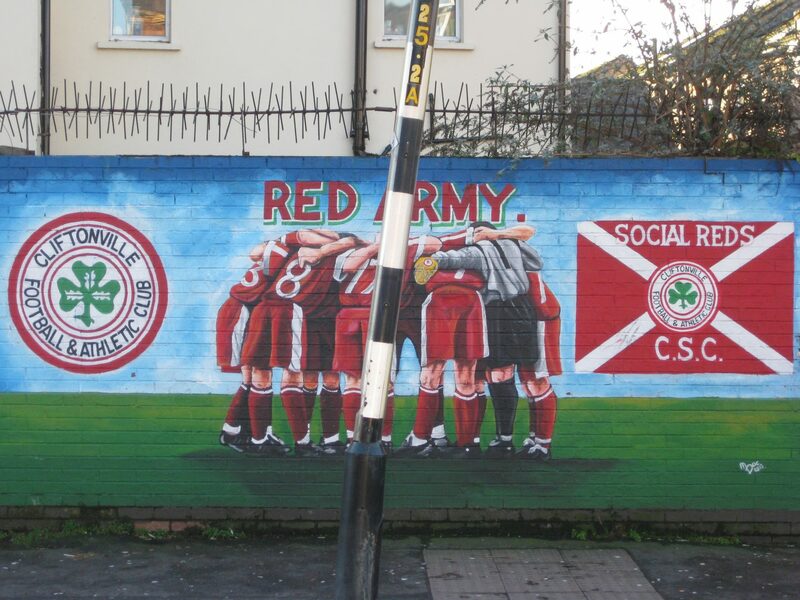 In Belfast, Republican murals are not as aggressive as Loyalist murals (but the thing changes in Derry). 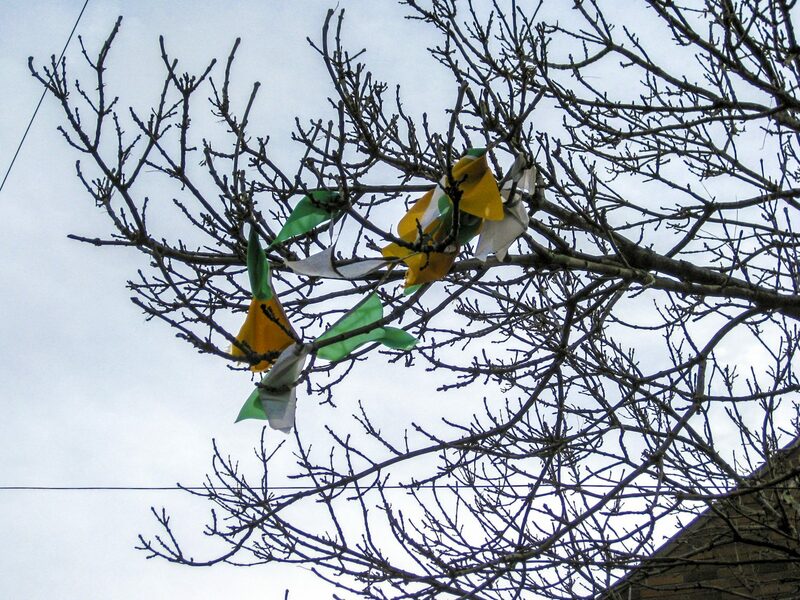 If you are in a Protestant area, you won’t see people wearing green, or any Ireland or Celtic jerseys. Likewise, in Republican areas, the color orange is nowhere to be seen—just like anything related to England, Northern Ireland, the United Kingdom, or Glasgow Rangers. Likewise, light posts and curbs are painted either in red, white, and blue, or green, white, and orange. 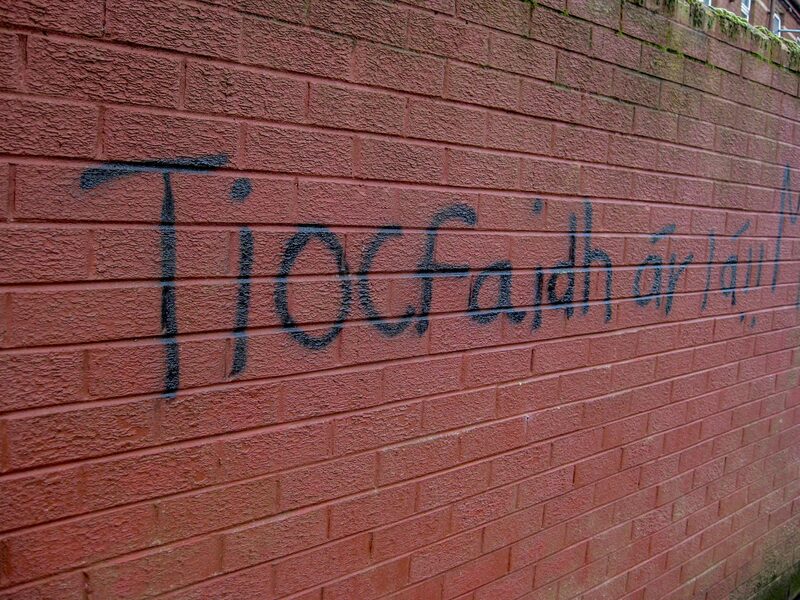 In Republican areas, you will also notice a lot of bilingual signs—especially in the Gaeltacht Quarter on the Falls Rd., in West Belfast (but more on that in a later article). I walked in order to get a better idea of the city. My hostel was located in South Belfast, very close to the Ormeau Rd., which runs parallel to the river Lagan. The southern Part of the Ormeau Rd. Is Republican, with murals and bilingual streets signs. 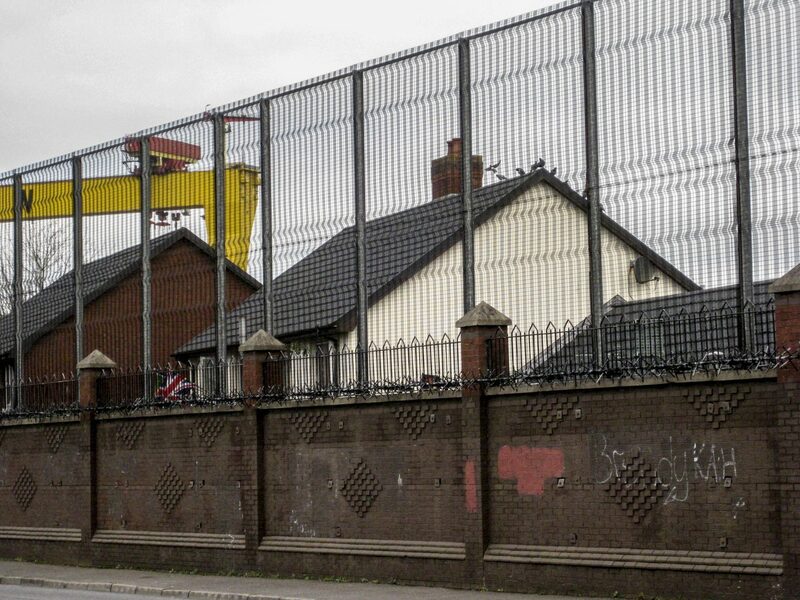 On the other side of the Lagan river is East Belfast, which is almost entirely Loyalist with the exception of Short Strand, a small Republican enclave surrounded by Peace Walls. Follow the Newtownards Rd. past Short Strand and you will immediately notice you are in a Loyalist area. 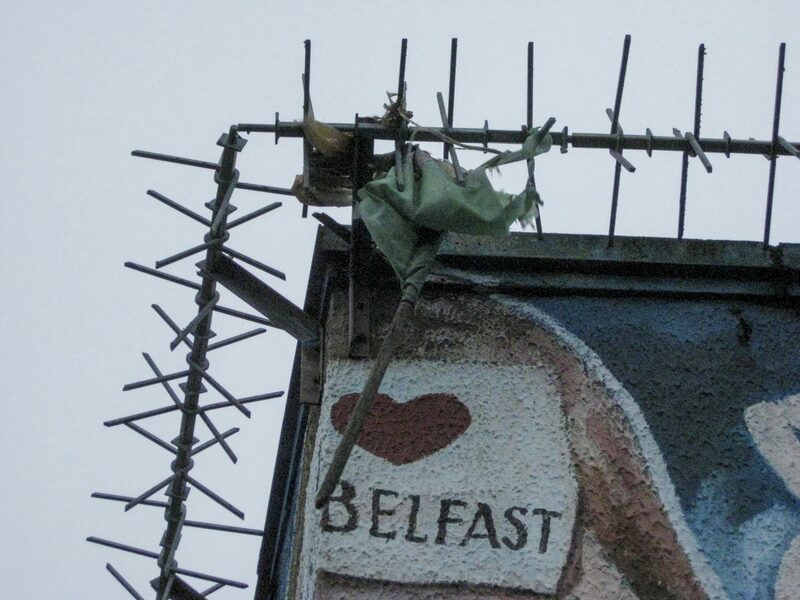 The rest of the area around the hostel, especially more toward West Belfast, is Loyalist through and through. 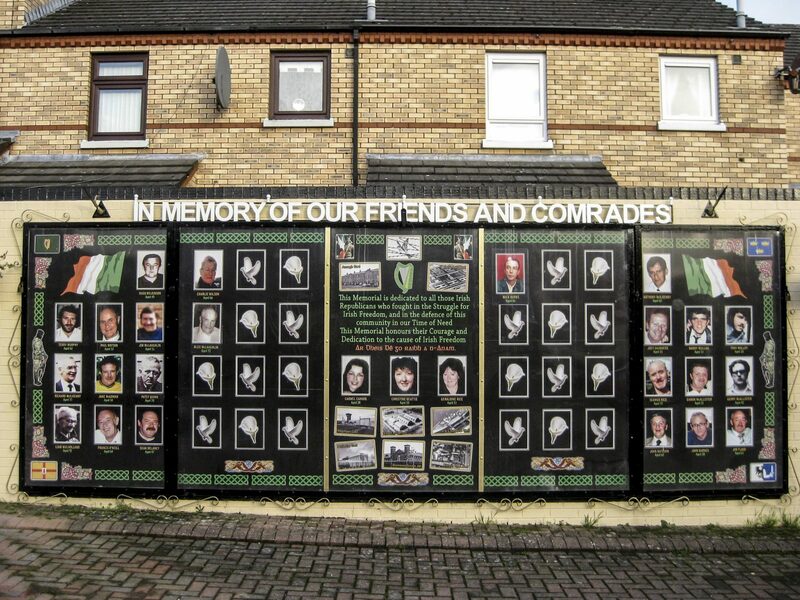 Not far from the hostel is Donegal Pass and Sandy Row, a Loyalist stronghold during The Troubles. 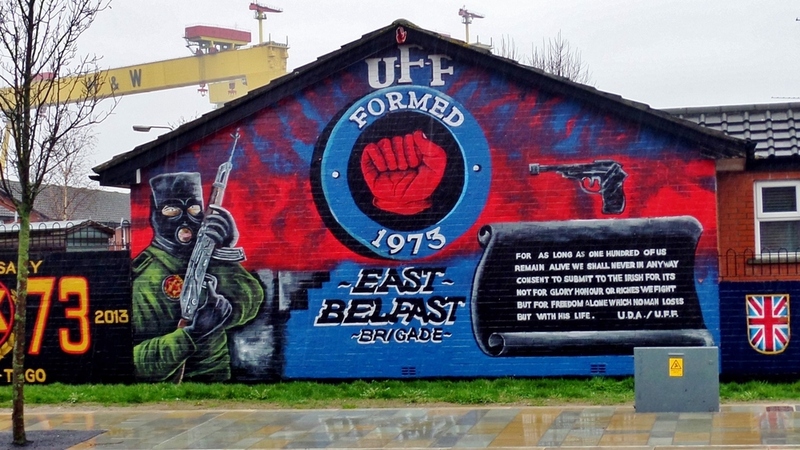 West Belfast is famously divided, with the Falls Rd. being a Republican stronghold full of murals. Not far from the Falls Rd. 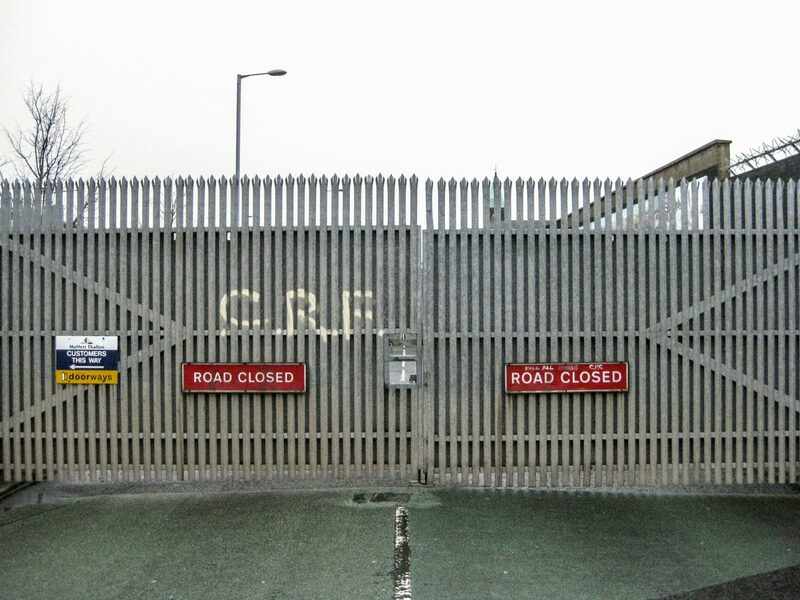 is a large Peace Wall, which separates this area from the Shankill Rd.—the Loyalist heartland of the city. Both streets run parallel to each other and you can cross from one to the other at particular points, which nevertheless close every day. Between the Shankill Rd. 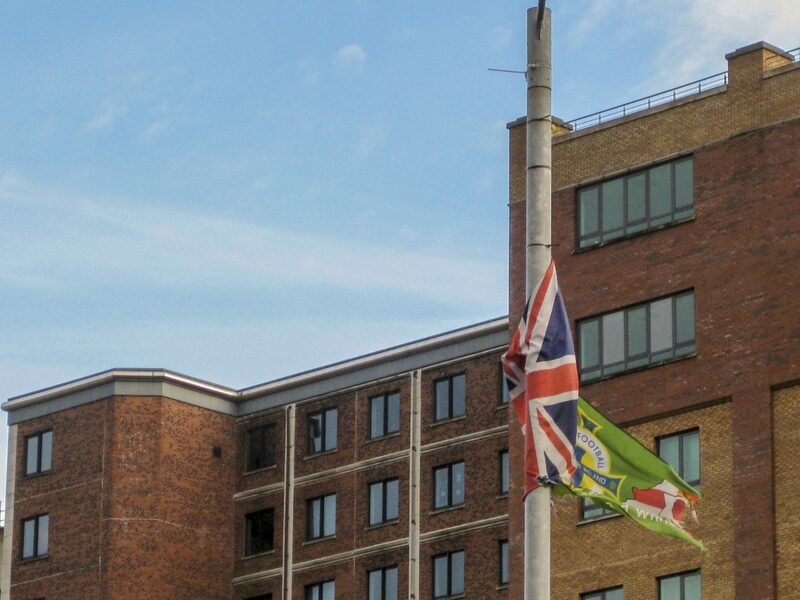 and Crumlin Rd., you are effectively in Loyalist country. 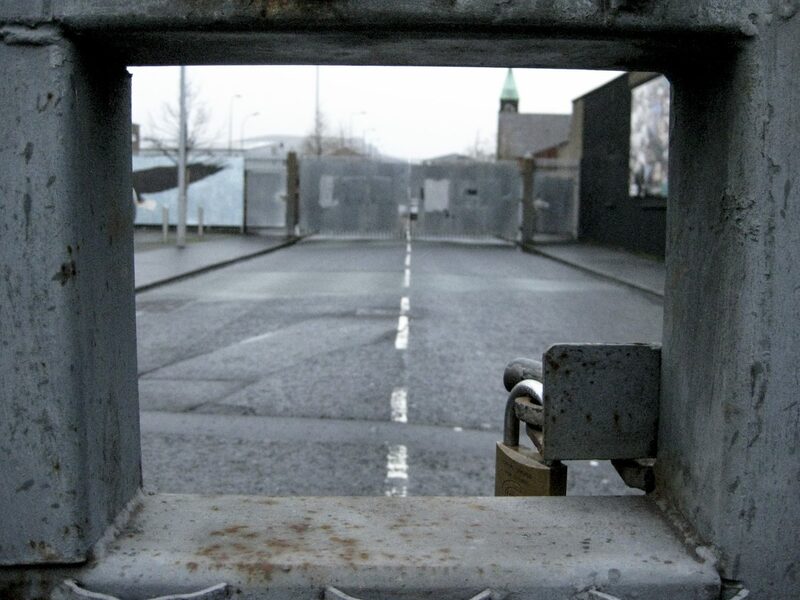 The Crumlin Rd., forks into the Cliftonville Rd., or “Murder Mile,” as the street was known during The Troubles. 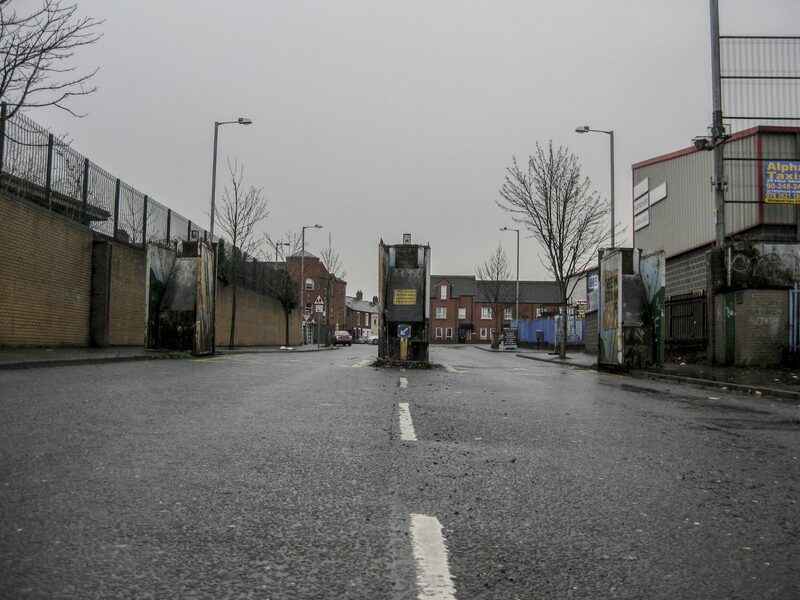 This street leads you through the Republican area known as “The Bone” to Ardoyne in North Belfast, where there is a massive IRA presence to this day. 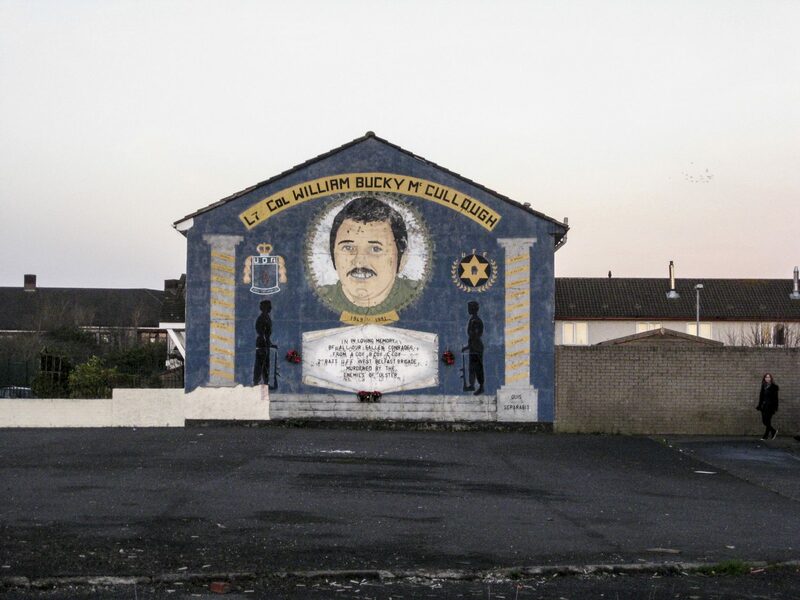 Further up north you reach the Protestant enclave of Tiger’s Bay, where the Loyalist UVF is also very active. Belfast is like nothing else I had ever experienced before. 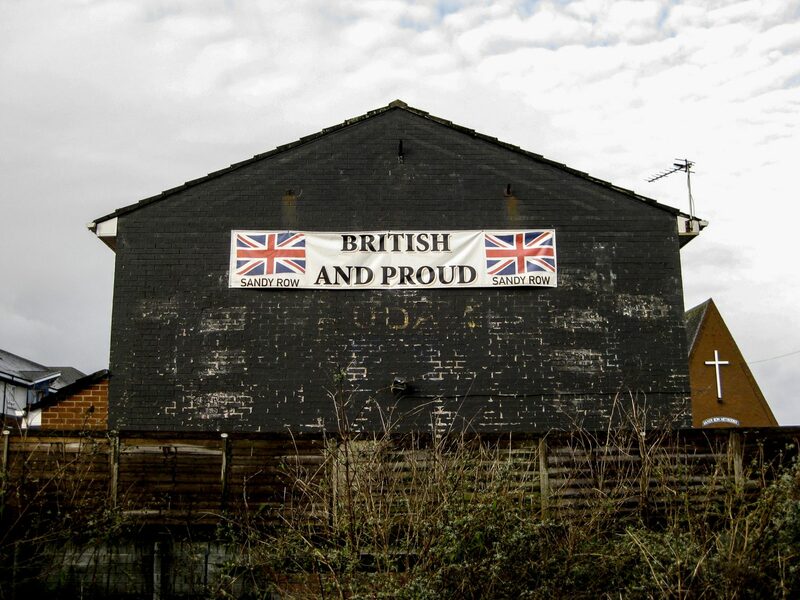 The difference between the Republican and Loyalist parts of town is immense—it’s like being in an entirely different country! Follow me on a tour of both the Protestant and the Catholic areas in the next few articles. Yeah, that’s right. I’m just getting started here. Do me a favor and like my page on Facebook. Likewise, please like me on Instagram to help Between Distances grow. And if you liked this article, please share it your friends! Thanks for your support! 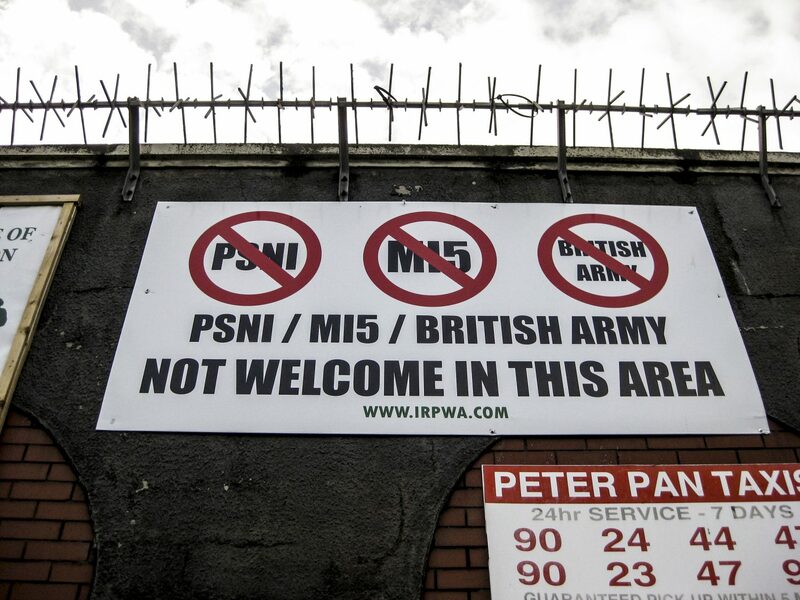 By the way, a couple of tips if you’re planning on visiting Belfast. No, none of them paid me to advertise them on this blog and I paid full-price for all the services they provided. I just appreciate the efforts of hard-working people and want to send more people their way. Next installment: The Republican Side. Take a taxi tour. There are many providers in town, but the one that was recommended to me by a knowledgeable local named Robbie really raised the bar. The company is called belfastmuralexperience.com and is owner-operated. They are a hard-working, friendly, and knowledgeable bunch who’ll give you a detailed and critical tour peppered with anecdotes. If you’re looking to do a unique walking tour instead, that knowledgeable local I mentioned above is launching his Belfast Political Tour this March. Listen to the stories of former political prisoners from the IRA and the UVF and gain a more complete understanding of Belfast’s violent past by taking a look at both sides of the coin. If you’re looking for a place to stay, try Lagan’s Backpackers Hostel. Great value for money, friendly atmosphere, and a full Irish breakfast is included in the price. I paid only 10 Euros per night. Last but not least, I’ve already said that these articles do the city no justice since they focus only on this history of violence. To discover more of what Belfast has to offer check out visitbelfast.com and visitwestbelfast.com. Thanks a lot for reading the article and your feedback! I am both aware of that and of the fact that that is not included in this particular installment of the series but I did go into that in the previous installment (a rather lengthy foreword) and will go into it again later. I’ll be going back to Belfast sometime this year and am looking forward to going on one of your tours. I actually booked one for Christmas Day but then was informed that the tour (understandably) would not take place. Anyway, thanks a lot again for reading the piece! Gosh, this is just so fascinating! I really like the way you mix in your own stories with the historical aspects of everything that is going on. Also, “damn, this is a fancy city,” made me laugh. Thanks a lot! Glad you liked it!